Researchers have long-acknowledged the principle that feedback is important and helpful, particularly to increase performance. Nevertheless, leaders are often reluctant to directly seek developmental (i.e., negative) feedback from their subordinates. Our exploratory study results reveal that one major reason is the belief that subordinates would not provide honest – and therefore useful – feedback because of the difference in power. Hence, our research examines conditions under which leaders may be able to receive more truthful feedback from their subordinates. Specifically, we hypothesized a positive association between the leader’s prestige-orientation and how truthful his or her subordinate’s feedback was. Furthermore, we extend theory on feedback-seeking, power, and prestige-orientation by theorizing the mechanism for this association: subordinate’s personal sense of power. After analyzing exploratory data, we are currently collecting data via a multi-source employee field-survey as well as by conducting laboratory experiments to establish causality and test our proposed mechanism. 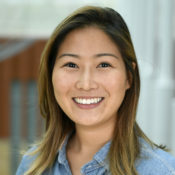 Kat Bae is a second-year PhD student in the Management and Organizations department at the Ross School of Business. Bae’s research examines social-emotional processes (e.g., social monitoring) and behaviors (e.g., feedback-seeking) in leader and follower relationships at work.